Can I feed my chickens strawberries | Can Chickens Eat Strawberries? ​Those of us who raise chickens at home will know that they are great to have around the house for a number of reasons. Not only does the average chicken make a fun guest in any household but they can also pay their way by producing delicious eggs. It stands to reason then that if you own chickens they should be treated like any other pet would and be given the occasional treat every now and then. When it comes to food, it is important to make sure you are not actually harming your chickens when you think you are treating them. In this article, I will be going through the benefits and disadvantages of feeding your chickens strawberries. It’s not uncommon to have leftover fruit and vegetables around the house, rather than wasting them it is far better to make use of your leftover strawberries and give your chickens a tasty treat. However, the effects the humble strawberry has on your chickens may be far different from you and me. This may seem obvious, but it is important to note that chickens or any poultry do not digest food in the same way that we do, so what might be a nice treat for us might be harmful to your chickens. The most apparent way we can see this is in terms of quantity, clearly what is a healthy amount of fruit to eat for a person would not be suitable for a chicken. But even if you were to scale down your portions to account for the small size of a chicken you must also take into consideration that a chicken’s diet should be balanced in a completely different way. For a chicken, an excess of fruit and vegetables can actually have an adverse effect on your chickens. If feeding your chickens strawberries exceeds over 10% of its food intake it can have a negative effect on the production of eggs; yielding less and lower quality eggs. Moreover, if this overfeeding becomes a habit, it can cause your chickens to become unhealthy. The reason for this is that unlike the humans’ chickens do not need high quantities of sugary and salty foods, and as such their digestive system is not equipped to break down sugary fruits like strawberries in large quantities and to overfeed them can lead to serious health problems if it is persistent. The fact that too many strawberries can be harmful to your chicken does not mean that you cannot feed them to your chicken altogether. 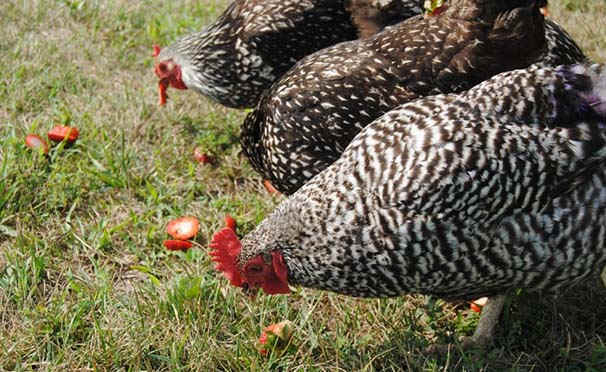 If done in moderation a few strawberries can be beneficial to your chickens. While all good chicken feeds will contain enough nutrients for a balanced diet, variation from what is ‘essential’ can be good for your chicken.If you occasionally give your chickens little treats every now and again such as a small portion of fresh strawberries it can have health benefits to your chicken like a lower chance of disease. Moreover, variation in a chickens feeding habits can affect the mental health of your chickens. It might sound weird to say that chickens can become stressed, but in this way they are just like you or me, eating the same thing day after day can affect the mood of your chicken that’s why occasionally feeding your chickens strawberries can reduce stress and stress-related conditions like feather picking. So, if you want to keep your chickens happy a small treat like strawberries can be just the thing that you need. If you are going to feed your chickens strawberries there a few things that you still want to keep in mind. First of all, don’t feed your chicken any leftover strawberries that are past their best, spoiled or moldy food can seriously harm your chickens. A good rule for this is not to feed your chickens anything that you wouldn’t eat yourself. Secondly, it is important to remember that even if it is for a treat, it is important that your chickens still can eat their food with some grit. As I have mentioned chickens are unable to breakdown sugary treats as well as humans and this extra grit helps your chickens to do this. As you can see feeding your chickens strawberries has its benefits and its disadvantages and whether one outweighs the other is entirely down to you. If you are the kind of chicken owner who often finds that they have leftover food and are responsible enough to make your chickens receive the right amount of fresh food then feeding your chickens strawberries is a good choice for you. However, if you do not already have strawberries around your house, there are a number of other things you can give to your chickens as a treat that does not have such a high sugar content. In the end, it all comes down to you.